I love cheese. Like, epic-novel-is-written-about-it-and-spends-120-weeks-on-the-bestseller’s-list kind of love. But I’m starting to notice that my “everything in moderation” mantra seems to apply to everything in my life except for cheese (and, at a higher level, dairy in general). It seems I’ve given my cheese-doling hand freedom to shower as much yummy, cheesy goodness as I want on every single meal. Which pretty much is the complete opposite of “everything in moderation”. So I’m trying to cut back a little bit on my cheese and dairy consumption. I’m not a big fan of cutting out entire food groups, but I’m also not a big fan of abusing entire food groups (well, maybe fruits and veggies), and my cheese, yogurt, milk, and butter consumption is bordering on abuse. The moment I knew I had a problem? When our cheese drawer in our fridge—which is huge, by the way—wouldn’t close because it was overflowing with cheese. I guess “cutting back” isn’t even the right way of putting it, more than anything, I’m forcing myself to be aware of the amount of cheese and dairy I’m consuming. And now that my cheese-sight has been opened, I can see how I probably didn’t need to put 1/2 cup of feta in my omelette the other morning—a tablespoon or two would have been enough. I’m mostly just wanting to inch the cheese and dairy lever slowly back to the moderate-consumption speed. 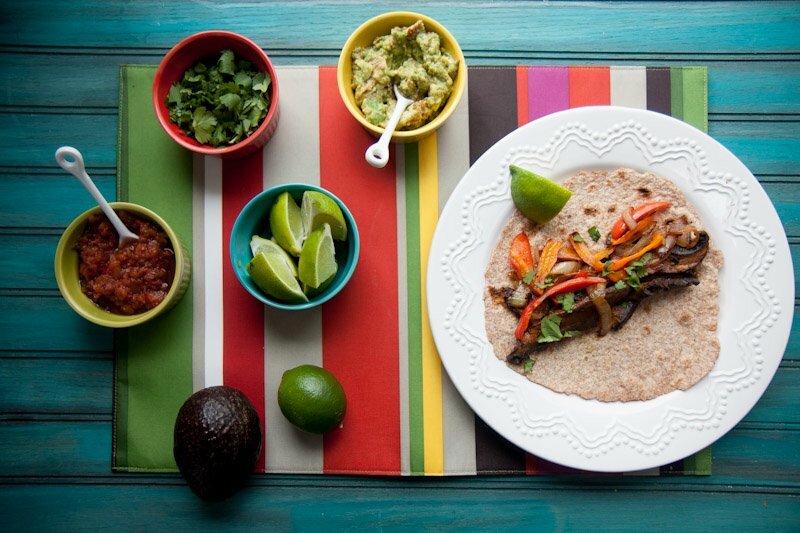 One of the ways to help me get through cheese withdrawal (I swear, it’s muscle memory to reach over to that cheese drawer and grab a big handful of something to toss on…everything) is to experiment with other flavors–especially on dishes that I’d usually smother in cheese—like these fajitas. Before I was forcing myself to be aware of my dairy consumption, I’d probably put 1/3 cup of shredded cheddar or Monterey jack onto two of these guys, plus four tablespoons of sour cream. That’s an extra 275 calories—and not a whole heck of a lot of extra nutrients. I get plenty of protein and calcium from other sources, so my dairy consumption is mostly just for taste reasons. 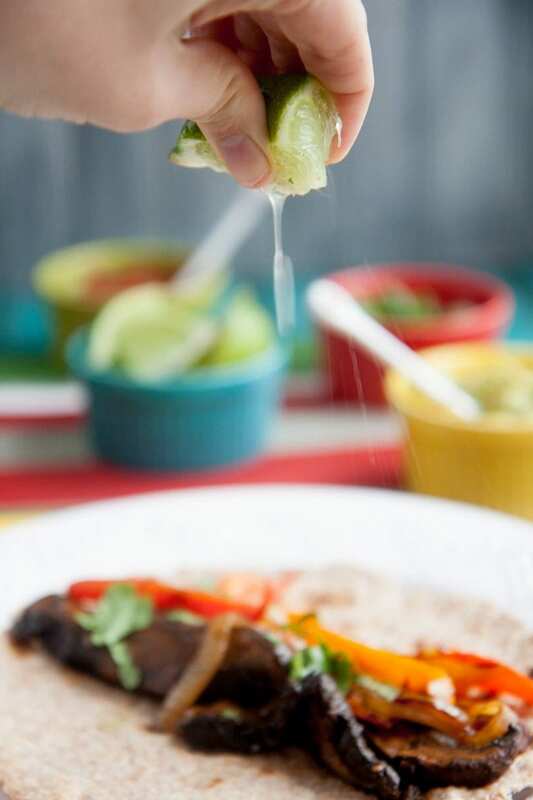 So this time, instead of covering up my food with dairy, I made sure the filling of the fajitas was incredibly flavorful and I had lots of yummy, non-dairy toppings to throw on. This is maybe one of the best Mexican-flavored dishes I’ve ever made! 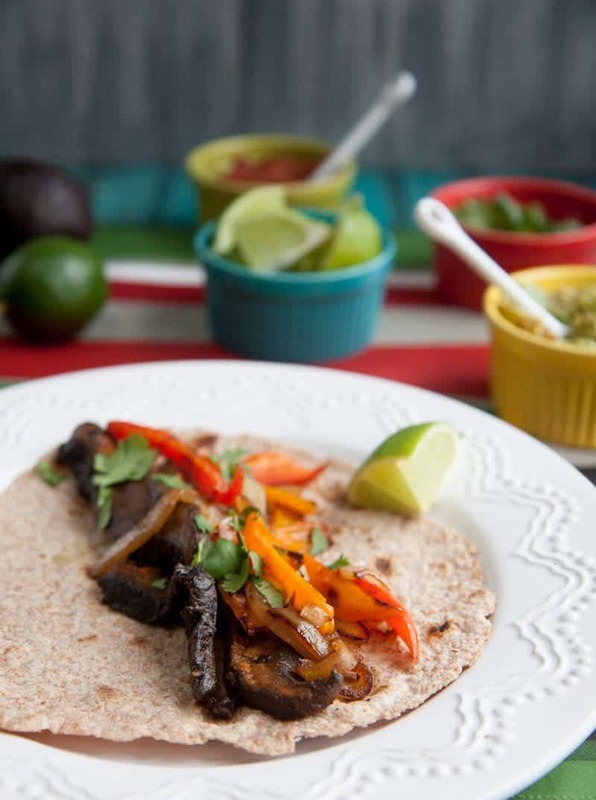 I marinated the portabellas in a spicy chile and lime sauce and then sautéed those and some sweet peppers and onions and packed them inside my whole grain coconut tortillas. And then I set out a fajita “bar” with chopped cilantro, fresh guacamole, salsa, lime wedges and (unpictured) black beans and plain Greek yogurt. I did cave and eventually put a couple of tablespoons of Greek yogurt on mine, but honestly, it wasn’t necessary—at all. All the other flavors worked so well together, that I should have just eaten it 100% dairy-free and saved the calories. It’s hard to break old habits. I want to save those dairy calories for when the dish really needs that flavor (like the scalloped potatoes I plan on making for Easter dinner this weekend) not just use it all willy-nilly. When I’m trying to lose weight, I like to think of calories as money in my bank account. And when I spend those calories on something, I want to try to get as much nutrient and flavor bang for my calorie buck. I wouldn’t spend $275 on a scarf that I just sorta like that doesn’t add much to my wardrobe. So why would I spent 275 calories on something that doesn’t add much to the dish? These fajitas are definitely going into regular rotation in our house. Not only were they delicious for dinner, but the leftovers made for one heck of an exciting lunch salad. Just throw the leftover sautéed peppers and mushrooms on top of some lettuce with the leftover guacamole, salsa, cilantro and black beans—flavor city! Not only were these portabella fajitas delicious for dinner, but the leftovers made for one heck of an exciting lunch salad! Toppings such as guacamole, salsa, chopped cilantro, lime wedges, black beans, cheese, sour cream, chopped onions, etc. In a large bowl, whisk together the marinade ingredients—minus the mushrooms—until well-combined. Add in the mushroom slices and toss to coat. I found that using my hands is the best way to keep the mushrooms from breaking. Let marinate at room temperature for 30 minutes. While mushrooms are marinating, you can prepare your toppings bar. Once mushrooms are marinated, saute in a large skillet over medium heat until they are very tender and have released most of their liquid—about 15 minutes. While the mushrooms cook, wrap the tortillas in aluminum foil and place in preheated oven to warm. In a second skillet, over medium heat, heat the remaining olive oil. Add in the pepper and onions slices and cook until very tender—about 10 minutes. 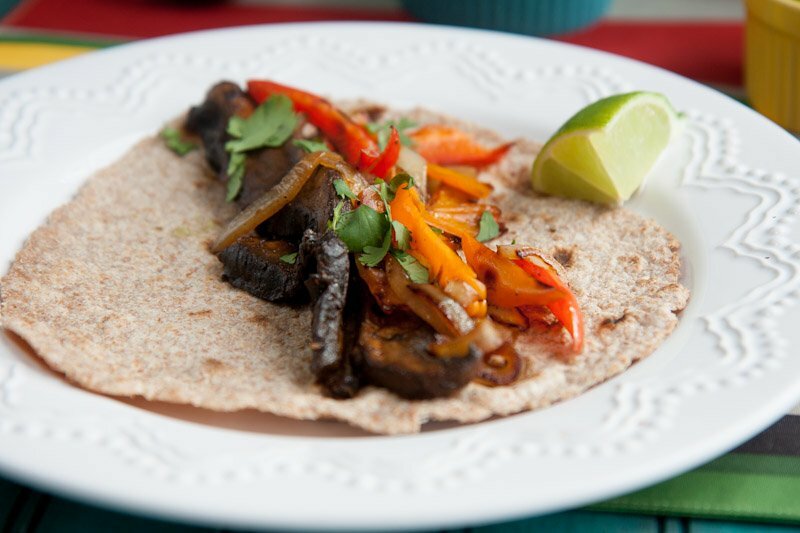 To assemble fajitas, place a few mushroom slices and a few pepper and onions slices in the middle of each tortilla. Top with desired toppings. Do you have one food that you tend to consistently over-indulge in? I used to have the same issue with cheese especially because I was using the bags of pre-shredded Kraft or whatever which has so little actual flavor you have to add a full cup to even taste it. When I started losing weight, I switched to the light pre-shredded bags o cheese, but found myself using just as much or more. The real change in moderating my cheese in-take finally came for me when I started buying really good, flavorful, high quality (read: also expensive) cheese and shreddding it myself – by hand, not with the food processor. I’m much more stingy with my cheese when 1) the cheese costs me a small fortune per block, 2) I have to actually take the time to slice or shredd it myself and 3) I can actually taste even just a half ounce in my dish. Thanks for this recipe! I’m looking forward to having this next week. Every week in our house we have similar dishes. Tend to switch between lentil tacos and fish tacos, but hopefully will have this added as a third option! The combination between lime, cilantro, avocado and chili powder is so good! We rarely add cheese or greek yogurt to these meals either. I tastes amazing without them so there really was no point. I’ve also been cutting down on my cheese intake to watch my weight and to also clear my skin up for upcoming wedding. My skin has been amazing! Btw, love that this recipe has portabello, I’m a mushroom-aholic! 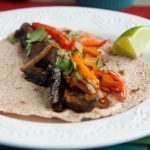 This is perfect timing, as I was looking for a good portabella mushroom fajita recipe to make tonight!! Sidenote: I’ve made your black bean burger sliders twice now and my husband (a big meat eater, but we’re trying to eliminate meat) can’t get enough of them. I’m also going to be making your falafel recipe this week. Thanks for so many awesome recipes and ideas – you’re making our transition to vegetarianism much easier and tastier than we thought it would be!! BTW, these were fantastic – will definitely be put in our regular dinner rotation. The marinade makes the mushrooms so flavorful! Ohh I love portobello and fajitas, great job cutting the cheese! I do the same thing. Guac is a good sub, has kind of a similar texture and you can trick yourself. Yum! These look amazing! I love making roasted chickpea tacos and last night my husband and I tried this recipe. It rocked! mmmmm…. these look delicious! We make taco salads at my house once a week. Lately, we’ve been using ground turkey breast, but use anything from grass-fed ground beef to tempeh and edamame to tofu. I always add in chopped up onion and mushroom to bulk it up if I use meat. I bet the leftovers of this were FANTASTIC. I would purposely make extra just for that! The fajitas look amazing, I also really appreciate your line of thinking when it comes to how to spend your calories.. I do a very similar thing and always try to get my nutritional bang for buck. I just need to tell you that this recipe is EVERYTHING!!!!!!!!!!!!!!!!!!!!!!!!!!!!!!!! Omg! I can’t stop saying how amazing it is and my husband is giving me the “we get it already look”! Thanks, definitely going into regular rotation! Yep, these were great. We grilled all the veggies and then crisped up the corn tortillas on a skillet. Did not add any dairy but did add avocado. Very satisfying even to the non-vegetarians. LOVE!